Halloween Ghost String Lights 70% OFF With Code!!! 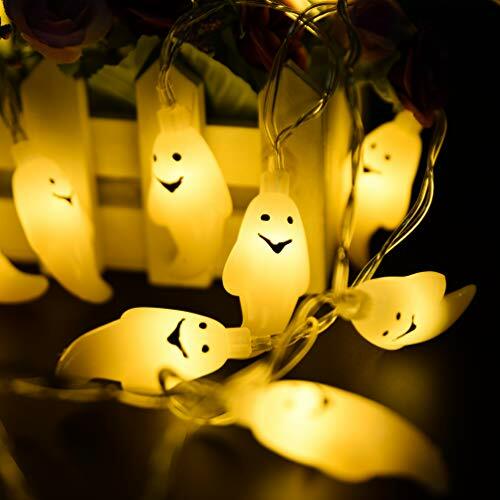 EASY TO USE: Each little ghost comes with a mini bulb which will produce a rich orange glow. These creepy crawly lights function with 2 modes: steady on and flashing. IP65 WATERPROOF RUGGED AS WELL AS BEAUTIFUL - IP65 rating means these ghost light will stand up to any weather conditions. The halloween led lights are connected by strong wire, and even if one light goes out the rest stay lit. LED light source, more durable and safer. BATTERY OPERATED: The lights are battery operated and take 3*AA batteries (not included), you can place it anywhere indoor or outdoor without the worry of needing a plug socket nearby. UNCONDITIONAL 1 YEAR MONEY-BACK GUARANTEE : We are confident that you will enjoy our products. We guarantee every order with an unconditional money back! If you are not completely satisfied, simply return the product we will refund your purchase.